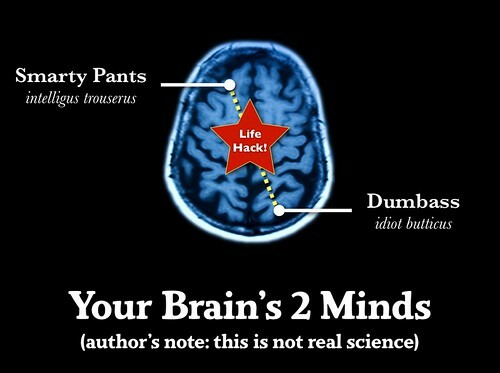 I've said before that, in my estimation, a life hack is any kind of trick that forces the Smartypants part of your brain and the Dumbass part of your brain to stay in proper communication. You think to yourself "Oh, I wear this all the time. I couldn't possibly throw it out." But humans are notoriously awful at accurately estimating these kinds of things -- I know I am anyway. And it takes stupid tricks like this to prove what inevitably happens when we let our Dumbass run off-leash. In the same way that you can't lie to your iPod, a good behavior-based life hack like this one will ensure that what you think is happening is supported by the evidence of what's really happening. Just a trivial bit of physical-world intervention will -- as my friend, Mr. Veen says -- make the right thing into the easy thing.